It’s no secret that we love the holidays around here on Craft Corners so we’re here to give you a few great ideas on decorating your yard. We’ll go over tips and helpful pointers that you can use should you want to deck out your house for some festive cheer. Happy holidays! What we suggest to do first is to find a day not only as close to the holiday you’re celebrating, but one where it isn’t raining or wet outside. We suggest to buy your lights at a general store because they can have them on sale throughout the later months of the year. Examine and critique your electrical outlets. 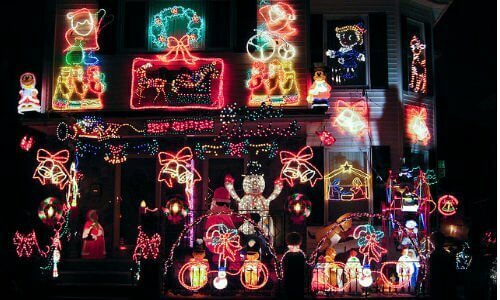 You don’t want to overload the power source of all the lights that you’re putting up, so check all of the outlets outside your house before you out them up. Take a good look around your house and see where you’d like to place your lights. A good place to always start is the trim of your roof. Generally it’s the easiest place to put lights because you can simply use something like a staple gun or take nails to your roof to have them hang on top of the nails. What’s nice about using the nail method is you can leave the nails up on your house for the next year but take the lights down once the holidays are over. Always experiment and have fun with the lights you’re putting up. They’re for the enjoyment of not just you, but for the rest of your neighborhood as well. Experiment with colors and don’t be afraid to be shy with the lights. The more the better in this case. That about does it for decorating your amazing yard full of holiday wonder and joy. Don’t forget to be safe when applying the lights along your home. Have a safe and joyous holiday season this year!